The vinyl project used installations made of vinyl film as signs and graphics output from the computer plotter and cutter. Vinyl was the single unifying means of making these works into a common medium, almost a theme of sorts. For the most part, it was a textual and graphical project, alongside the use of vinyl as a more purely inert material, used by some of the participants to build and construct. It was essentially a project for an expanded book of parts, an anthology using the nooks and crevices of a building in a certain state of decay, instead of the page. The new work was layered onto existing surfaces, prominent features and other facets of a building that remained unaltered by these additions. 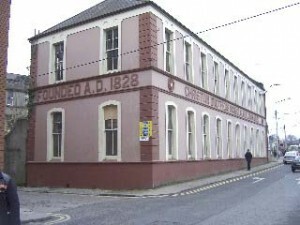 Its presence was left to be discovered in the new context, situated in a collective space normally used for a different purpose: a school on Sullivans Quay. You could hop across Tim Robinson’s map of the Aran Islands placed centrally in the school playground, past Kathy Prendergast’s ‘A is for Alone’ , to Maud Cotter’s construction accumulating through the corridor of the first floor.Outside the gymnasium, Martina Galvin tensioned 27 miles of translucent blue fishing filament into a curtain. On the gable end of the main building, Lawrence Weiner cited material construction as text, and on the other Marie Bourget produced a robotic drawing of a spinnaker sail from the computer programme Illustrator. These were merely six approaches to the project, others were worked out more organically on site during the course of their installation. The well-stocked bookroom focused information on the project, and books were available for purchase. It contained books by poets, artists and writers involved in the project, together with work of poets and writers of Soundeye’s Cork International Poetry Festival, which took place in the first weeks of the installation in its bookroom and other parts of the building. l.